In part one of this piece, we introduced the notion of a physics-powered startup and why now is the time to invest. Below is an overview of the most promising areas (transportation, energy, infrastructure, manufacturing, human augmentation, and computing) to find physics-powered startups and some theses we at Prime Movers Lab anticipate driving value creation in the coming years of inventing the future. In the decade to come, there will be new opportunities in mining, research, data centers, tourism, cargo and water storage in space. Winners will find ways to validate market needs early on before committing to massive capital expenditures. The cost of getting started has dropped dramatically such that seed rounds should often lead to demonstrated proofs of concept prior to large fundraises. There are also now a number of already accomplished space entrepreneurs building second or third ventures based on their previous learnings. SpaceX, Blue Origin, and Virgin Galactic have pioneered a new era of commercial space. For small satellite launch, Rocket Lab and Vector are working to make it affordable to deliver cubesats and nanosats into orbit. 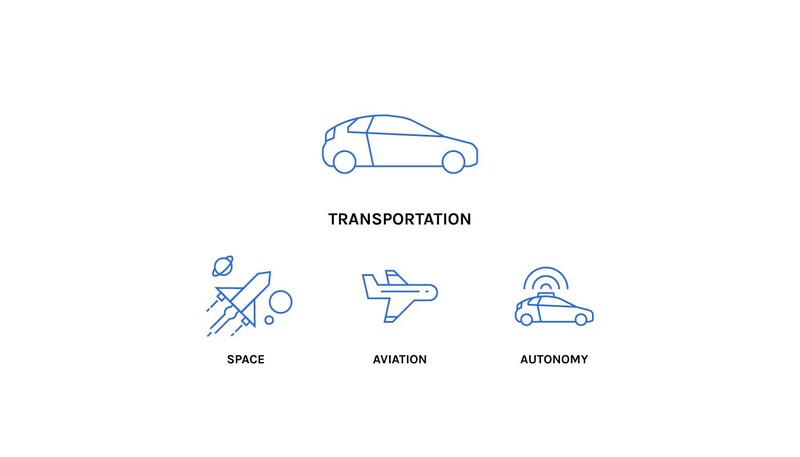 Momentus (a Prime Movers Lab investment) is the first in-space transportation service making ride-sharing affordable. Planet Labs, Ursa, Orbital Insight, Urthecast, and Satellogic are leaders in delivering satellite imagery data. SpaceTango and SpacePharma enable in-space research. Most aviation-related venture activity centers around unmanned autonomous vehicles (UAVs). Beware of the already crowded drone ecosystem in considering new investments and pay close attention to the major regulatory hurdles. We anticipate opportunities in new components or parts of the supply chain that already established players will be interested in acquiring. For new plane startups, there will be an increasing focus on electric airplanes and other approaches to decreasing energy costs for aviation. Crucial to success is arranging significant LOIs early in the company’s life to establish meaningful pre-orders validating customer demands. Google’s Kitty Hawk, Uber’s Elevate, Volocopter, and EHang are the leaders in UAVs designed for vertical take off and landing (VTOL). For industrial drones, keep an eye on Airobotics, SiteAware, Percepto, PrecisionHawk, and Kespry as companies that have already established meaningful customer bases. Boom (an investment of Prime Movers Lab Founder Dakin Sloss), Aerion and Spike have raised significant capital to develop supersonic planes. Successful new startups in autonomous vehicles will largely focus on three areas: sensor suite supply chain, new business models given the elimination of the need for human drivers, and acquisition targets for bigger players. While autonomous vehicles are still new, the market has already received significant investment so it is important for new entrants to carefully consider their position in this crowded market. Additionally, the wave of recent safety concerns may impact the regulatory environment and thus the timeframe for widespread adoption of these technologies. Google’s Waymo and Tesla Autopilot capabilities are leading the market towards fully autonomous vehicles. GM, Audi, BMW, Mercedes, and Toyota are all actively investing in this area. 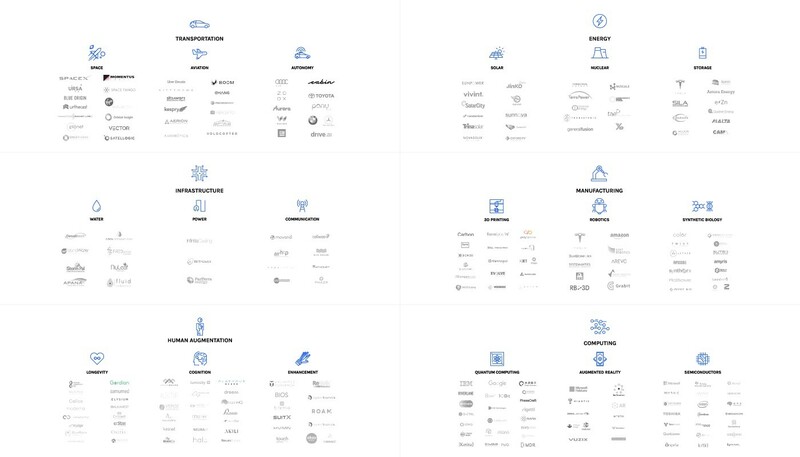 Zoox, Pony.ai, Drive.ai, Aurora, and Kache.ai have established themselves as leading startups. The rapid deployment of autonomous vehicles opens new questions across the auto industry including: suspension (see Cabin, a Prime Movers Lab portfolio company), parking, trucking, and insurance. Solar is a tricky space to invest in given the extraordinarily high failure rate in the clean-tech bubble from a decade ago, the large number of interested and competitive investors, and the large level of capital required to reach a proven product. That being said, next generation panels that can dramatically increase efficiency appear to offer meaningful upside to compensate for the significant technological risks most will have to overcome. It seems like an inevitability that solar costs will be driven down by new materials advances enabling much larger scale deployments. With Tesla’s acquisition of SolarCity, they are one of the top 5 solar panel providers in the US along with Sunrun, Vivint, Sunnova, and SunPower. JinkoSolar, Trina Solar and Canadian Solar are the three largest manufacturers. The expansion of solar has already accelerated in the past few years as costs have dropped with new inventions and improved economies of scale. Related opportunities include new cell materials such as peroskovite (TandemPV, OxfordPV) or carbon nanotube antennas (Novasolix). Across the board, these companies have required significant capital investment and have yet to reach meaningful commercial milestones. To enter the nuclear market as a new player, consider either breakthrough approaches with lower capital expenditures or peripherally related technologies in the fields of laser physics and magnets that can serve not only the nuclear market but also other areas. Nuclear fission and fusion startups have received significant investment as of late. Fission reactor designs include molten-salt (Transatomic, Terrestrial, Terrapower), small modular (NuScale), gas-cooled (X-energy), and fast-spectrum. Well-funded fusion approaches include magnetic confinement (Commonwealth Fusion Systems, Tokamak Energy), hybrid (Tri-Alpha Energy, General Fusion), and inertial confinement (primarily in national laboratories rather than startups). Particularly as solar and wind adoption scale, long-term energy becomes crucial to address intermittency issues. 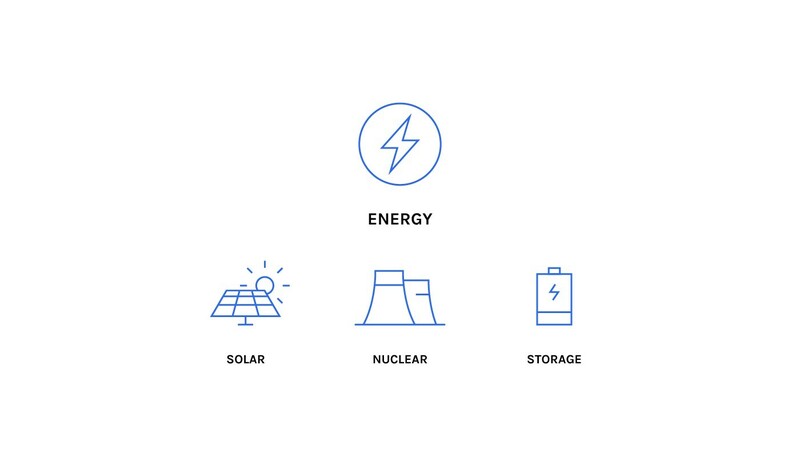 For long-term storage, the primary question for new startups is the combined cost of the storage solution along with the energy source and how competitive the economics are with alternatives. For short-term storage, any new technology has to be able to out-compete or serve as complementary to existing Lithium-ion approaches, which continue to plummet in cost rapidly. The explosion in the number of battery startups with ambitious claims means healthy skepticism is appropriate. It is important to perform meaningful diligence of the fundamental science and engineering challenges. For long-term storage the competition includes Malta, Form, e-Zn, Quidnet, Antora, and Aquion. For lithium-ion battery manufacturing Tesla and Farasis are major players. New materials for various use cases are being pioneered by Sila Nanotechnologies, Ionic Materials, and CamX. The market for water startups appears relatively nascent and full of new opportunities both for further capitalization and new breakthrough inventions. The key challenge is to increase access to clean water with minimal costs that can scale. Additionally, industries such as oil and gas shale that have dramatically increased demand for water are seeking approaches to mitigate their water consumption. Filtration-related companies include Desalitech, Cool Separations, and StormPal. Leak detection companies include Utilis and Fluid Robotics. Cleanliness detection companies include FredSense and NuLeaf. Monitoring companies include Apana, WellIntel, and Island. In evaluating power-related opportunities, regulatory complexity and build-out challenges leading to timeline concerns are the most likely stumbling blocks for achieving venture-like returns. We also look for opportunities here with unusual levels of leverage, typically involving licensing relationships or partnerships with already established players operating at scale. Power plants are some of the most conservative adopters of new technology and consequently there are relatively few new technology startups serving this market. The notable exceptions include Infinite Cooling which provides water capture and recycle systems to power plans to minimize vapor losses. Net Power is building the first ever zero-emission natural gas power plant. Geothermal providers such as PanTerra are another interesting category. 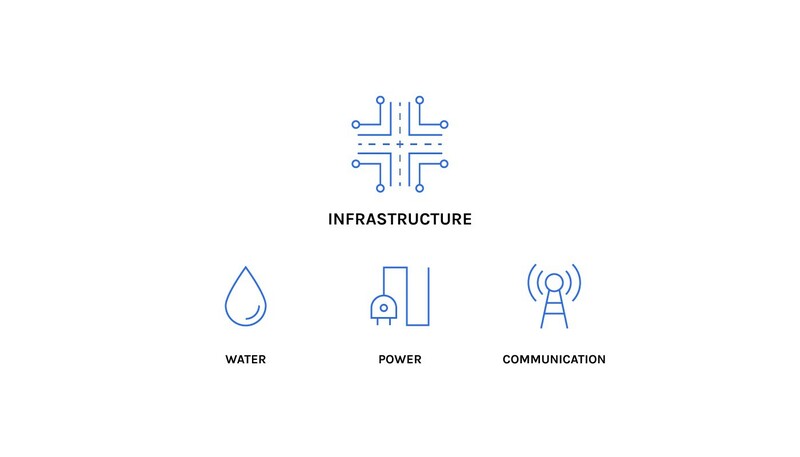 The introduction of 5G communications will enable a new wave of IOT devices, autonomous vehicles, smart cities and other high bandwidth applications with speeds up to 20 GB/s. Start-ups and established telecoms are focused on innovations that increase performance cost-effectively and utilize low power. Unlike in previous wireless technology waves, there will be ample opportunities for savvy startups to contribute to and benefit from the coming 5G revolution if they identify the right niches and ways to collaborate with larger partners in the ecosystem. Movandi, Phazr, Pivotal Commware, FabaEarth, Athonet, CellWize, CellMining, AirHop, Core Network Dynamics, Blue Danube, and Vasona Networks are some of the startups leading the way in 5G and related applications. 3D-printing has been generating enthusiasm for some time but is just hitting its stride for non-prototyping use cases. The most important considerations in this market are how to deliver on the long-awaited promise of 3D-printing for manufacturing at scale. Thoughtful business models to create massive customer value while avoiding margin compression will be crucial in determining winners. Some leading and interesting printer startups are Carbon, Cubicon, Snapmaker, 3D Systems, Form Labs, Origin, MarkForged, Apium, Evolve, and BCN3D. The players in on-demand manufacturing and prototyping include 3DCompare, 3D Printing Studios, and Voodoo. For metal-related printing and materials keep an eye on Desktop Metal, Xjet, Aurora Labs and Hitch. Impossible Objects, and polySpectra (a Prime Movers Lab investment) are innovators in materials to make additive manufacturing truly scalable for global production. Robotics is advancing extremely rapidly and has applications across transportation, energy, infrastructure, and health. We anticipate robotics innovation to continue to drive down the cost of manufacturing. Additionally, humanoid-like robots are closer to market than you might think and will face interesting social challenges to acceptance and integration into our daily lives. Here we focus on robotics as applied to manufacturing and supply chains, which both Amazon and Tesla have invested in heavily. Soft Robotics, Arevo Labs, Smart Robotics, QKM, Grabit, Systemantics, LifeRobotics, RB3D, BlueWorkforce, Softwear, and Ready Robotics are all worth tracking. Funding for synthetic biology startups has exploded in the past year soaring past $3 billion. The field is changing rapidly and we expect new low-cost players to enter existing markets and for new application domains to emerge. It is essential to investigate the defensibility of intellectual property in this area to ensure that investments can establish significant competitive advantages. 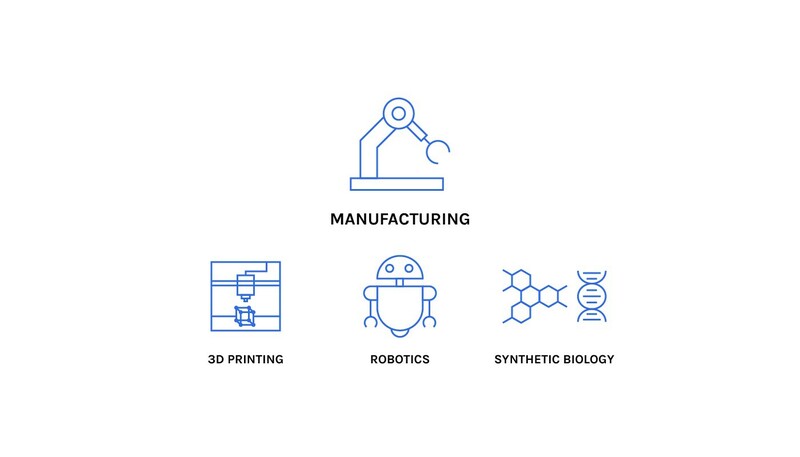 While many of start-ups focus on therapeutics and genetics (Synthorx, Sutro, Twist), a significant portion of synthetic biology startups are contributing to new low-cost manufacturing. Zymergen, Gingko, Bolt, Impossible Foods, Amyris, AgBiome, Aether, Riffyn, LanzaTech, BioCellection, Pivot Bio, and Synthace are transforming the production of chemicals, materials, food, fuel, agriculture, plastics, fertilizer, and aromatics. We are in the midst of a revolution that will dramatically extend human lifespan. While the level of investment and start-up activity here is extremely promising for our species’ ability to live longer and healthier over the coming decades, keep in mind that many of these approaches will require years or more to test and validate before reaching the market. Human Longevity, Nuritas, and Color lead the way for genomics. Celularity and Osiris are the frontrunners in stem cells. Elysium has paved the path for supplements. Moderna, Editas, Autolus, Synthego, Precision, Translate, CytomX, Voyager, and Gordian.Bio (a Prime Movers Lab investment) are pioneering gene therapies. Other therapeutics companies include Calico, BlueRock, Unity Biotechnology, resTORbio, Alkahest, and Samumed. Just as exciting as the developments in longevity, we are seeing vast steps forward in our ability to improve human cognition. For cognition startups, it is still the early days as our understanding of neuroscience is quite limited compared to where we anticipate it to be in a decade. We anticipate both large winners here and some major flops as capital is currently being deployed into a number of research projects with overambitious valuations. Alzheon, Neuraly, Cerevel, Alector, and Verge are focused on neurological disorders such as Alzheimers and Parkinsons. Lumosity, BrainHQ, Akili, and NeuroTracker leverage apps and visual tracking devices to improve focus, memory, speed and decision-making. Halo, Thync, and NeuroStar offer stimulation to target brain areas using electric pulses. Emotiv and Spark use EEG to measure and assess targeted brain functions in order to solve defined problems. Muse, BrainCo, Dreem, and Focusband monitor mental states and pair with an app to help retrain the brain. Kernel, Neurable, and Neuralink integrate brain function with computers for enhancement. Platypus (a Prime Movers Lab investment) combines a number of the modalities described above. We believe that a vast array of new startups will emerge focused on human physical enhancement. The best companies will find ways to deliver their innovations to users early on without needing regulatory approval by focusing on non-medical use cases. The open question is how to find the sweet spot between the urgent needs of medical customers and the limited regulatory burdens in serving the broader consumer population. 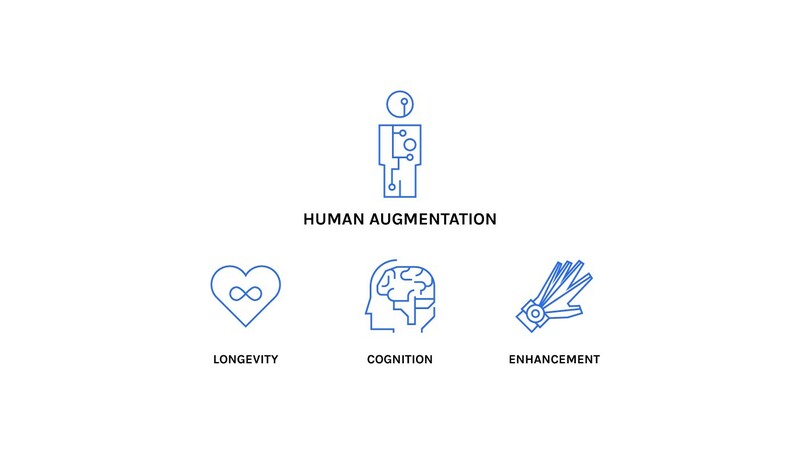 The wide range of opportunities to enhance human performance spans prosthetics (Unlimited Tomorrow, Cambridge Bio-Augmentation, Open Bionics, Touch Bionics), exoskeletons (Roam, Ekso, ReWalk, SuitX, B-Temia), new senses (CyborgNest), and supplements (HVMN). Competitors are pursuing two goals: quantum supremacy (quantum computers performing better than classical computers in largely theoretical challenges) and business value for customers. We believe the creation of quantifiable business value for enterprises will separate the winners from the pack. Meaningful scientific and engineering challenges remain to achieve this. As Google, Microsoft, and IBM are racing to build quantum computers, quantum computing startups have received substantial funding to realize the promise of breakthrough computing capabilities. Integrated software and hardware companies include D-Wave Systems, Rigetti Computing, and Xanadu. Software-focused companies include 1QBit, A*Quantum, BOHR∞, CQC, D Slit Technologies, Elyah, GTN LTD, Horizon Quantum Computing, ISARA, Ketita Labs, Multiverse Computing, PhaseCraft, Q-Ctrl, River Lane Research, and Strangeworks. 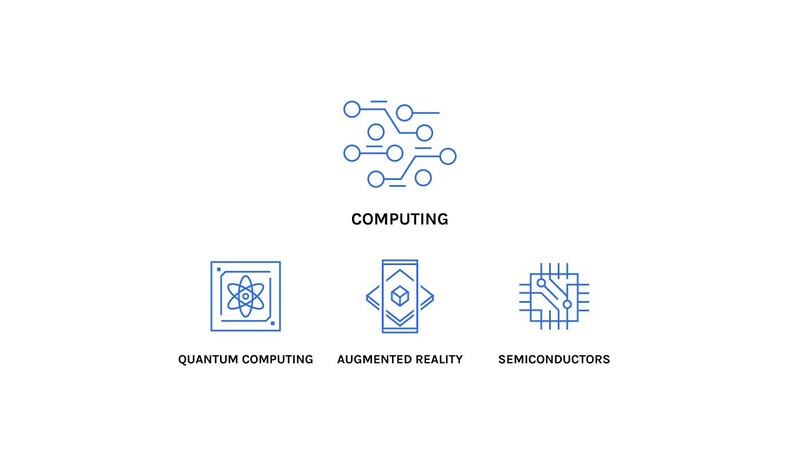 Hardware-focused companies include Atom Computing, Bleximo, ColdQuanta, Delft Circuits, EeroQ, IonQ, MDR, Origin Quantum Computing, PsiQuantum, Quantum Circuits, Inc., Qubitekk, QuiX, and Silicon Quantum Computing. The past few years have made clear that the headset technology is not yet ready for mass consumer adoption. As a result, startups will likely succeed by creating raving fans in niche enterprise markets as a base from which to build larger consumer-facing businesses later. Google Glass, Apple AR for iOS, Microsoft HoloLens, and Facebook Oculus are aggressively investing in augmented reality and virtual reality as a next generation computing platform. Startups competing with their own hardware are lead by MagicLeap, HoloLamp, DigiLens, Lightform, North, Vuzix, and WaveOptics. Startups providing software for augmented reality include Niantic, Augmedix, Reification (a Prime Movers Lab investment), and RealCast. In all of the semiconductor startups to come, it is of the utmost importance to protect intellectual property from the bigger players while also finding ways to partner and leverage their size to scale. We expect the vast majority of successful startups in this area to exit in acquisitions to the already well-established leaders mentioned above. Samsung, Intel, Qualcomm, Broadcom, Texas Instruments, and Toshiba are the largest semiconductor companies and they are funding and acquiring breakthrough inventions across a range of applications. Lyncean, SiFive, Inpria, Irresistible Materials, and Astrileux are working hard to ensure Moore’s law continues as we are hitting and foresee further challenges in the physics and economics of denser silicon chips. KnuEdge, krktl, Graphcore, Wave Computing, Tenstorrent, Cerebras, Mythic, ThinCI, Koniku, SambaNova, Horizon Robotics, and Adapteva are competing to invent and distribute new AI chips specifically designed to enable edge computing and machine learning. 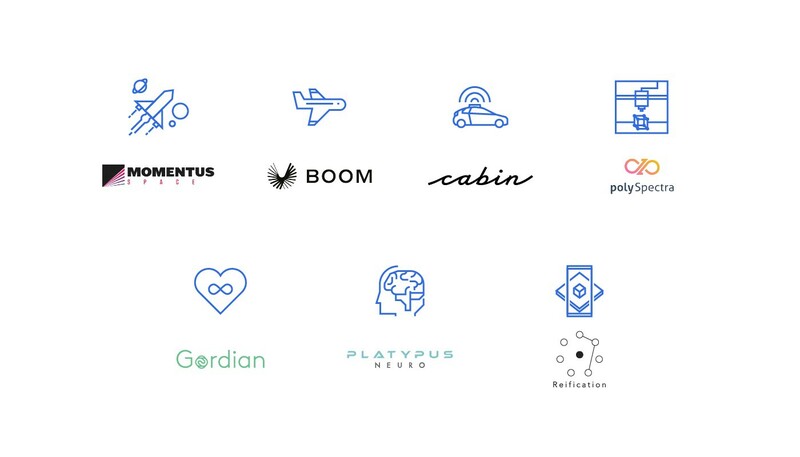 In part one, we defined the characteristics of physics-powered startups that Prime Movers Lab backs and why now is an attractive time to invest. In part two, we explored the opportunities to invent the future of space (Momentus), aviation (Boom), autonomous vehicles (Cabin), solar, nuclear, energy storage, water, power, communications, 3d-printing (polySpectra), robotics, synthetic biology, longevity (Gordian.Bio), cognition (Platypus), human enhancement, quantum computing, augmented reality (Reification), and semiconductors.